By George – All for a few dried figs ! Yesterday we took the not-so-correct decision of going to George Town … all because the last time we went there with Nachi and Kousalya, we found the dried fruits (raisins, figs etc) and cashewnuts that we got here ended up being cheaper and of better quality than what we found in my beloved Delhi :). An evening spent chatting over “chaat”. 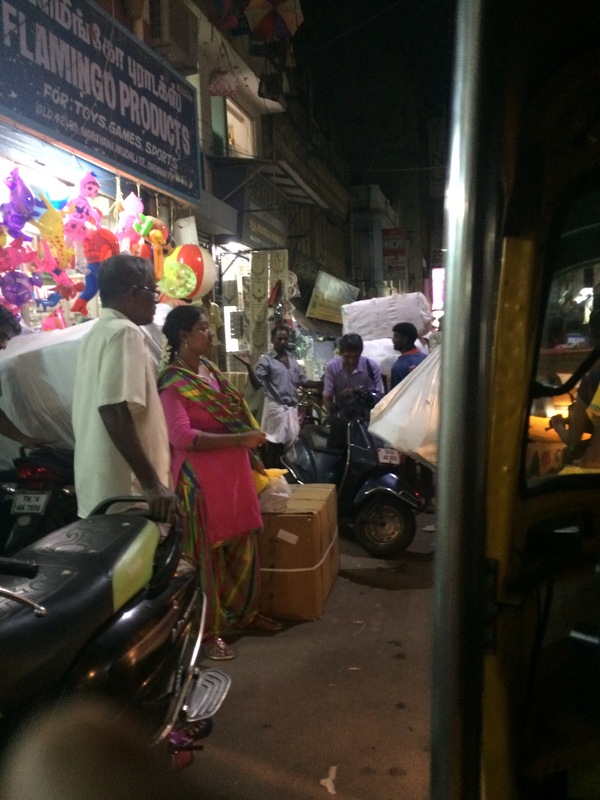 We started at 5 pm and the uber driver was new to Chennai, so Krishnan gave him directions to reach our destination. He ended up not taking one of the left turns just after the Central station because Krishnan thought the next left was also available …. which was not. So we got down on the side of the road by 6.10 pm and walked down to Nyniappa Naicken street, first. Krishnan remembered a pharmaceutical store here called “Dadha medicals” from his days in Cipla, so we went looking for it as we wanted to get some medicines for my mom-in-law. The Nyniappa Naicken street starts with shops selling locks and steel/aluminium trunks and then hundreds of stores that sell all medicines, chemicals etc. My first experience of walking in a street that was narrower than the elevators at the Dubai airport …. 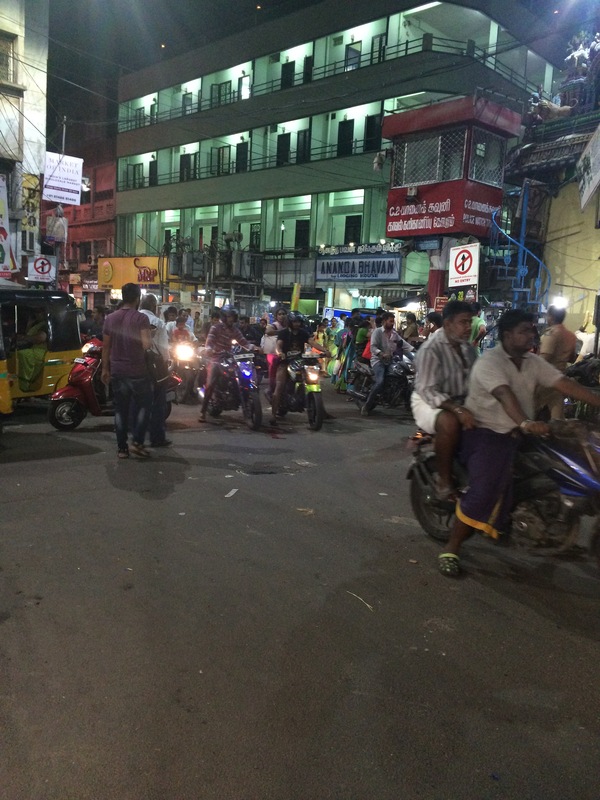 autos, scooters, bikes, pushcarts, small trucks, cycles, and hoards of people jostling in that space. I managed to persuade Krishnan to ask a shop keeper as to where the medical store was because I was almost in a state of panic to continue walking around. We back tracked a few metres and asked again when we couldn’t find the store. Finally we got the right information that the store was no longer there and only a building by that name existed. We decided not to get the medicine and started to walk towards the NSC Bose road to find our dried figs. Just then we noticed a store that was selling medicines in retail and Krishnan walked into a small cave like passageway to check if that store existed. It did and before I could feel like I was an exhibit in a zoo standing between two cycles on the “lane”side, he rescued me by asking me to come inside the store. Ah air-conditioning never felt better. I stood in a corner while Krishnan got the medicines. The thing that struck me was people walking in absolutely comfortable in small cramped spaces and going about their work in no hurry. I ran through a pack of tissues (10) and had started using my sari’s pallu to blot the sweat that was running down my face like the Ganga flowing from Shiva’s topknot :):). We got the medicines at a 15% discount but by paying cash as they were charging 2% service charge for a credit card. 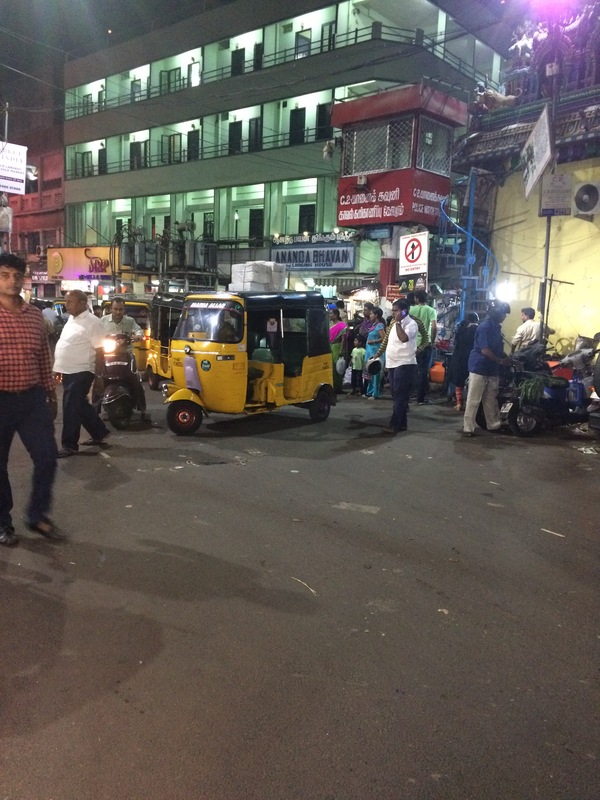 From this place we walked to NSC Bose road (yes, a road named after our great freedom fighter Netaji Subhas Chandra Bose) and then onto Govindappa Naicken street which had stores that sold fruits, dried fruits, spices and electrical stuff. For the first time we were in a road where the traffic jam didn’t allow pedestrians to go forward. By this time I had been drenched in sweat and was ready to go back home. So we turned back and got into a store at the beginning of the street to buy the darned dried figs! Well, the price per kilo drove us out of the store in double quick time – it was Rs. 1500 per kilo of dried figs, nearly 50% more expensive than Delhi. I asked Krishnan to take me back to that same store where we had bought the dried figs last time. This was on the Audiappa Naicken Street and Krishnan tried explaining how it was connected to the Govindappa Naicken street but well, I was just ready to bolt out of that place – without buying a single fig :):). We went back to NSC Bose road and took the Naryana Mudali street to reach that shop after escaping a gentle push by a fully grown cow. Temporary relief. The store had dried figs of the same quality like last time and at Rs. 800 a kilo it was reasonable and actually cheaper than Delhi. Before we could place our order, Krishnan asked if they will accept a credit card, much to the amusement of the owner who thought we belonged to some other planet. They accepted only cash, period. So I stood at the store while Krishnan went in search of an ATM that could dispense cash and he found it nearly 800 metres away opposite his school !!. Once we got back, we made our purchases and I refused to walk from that point on. 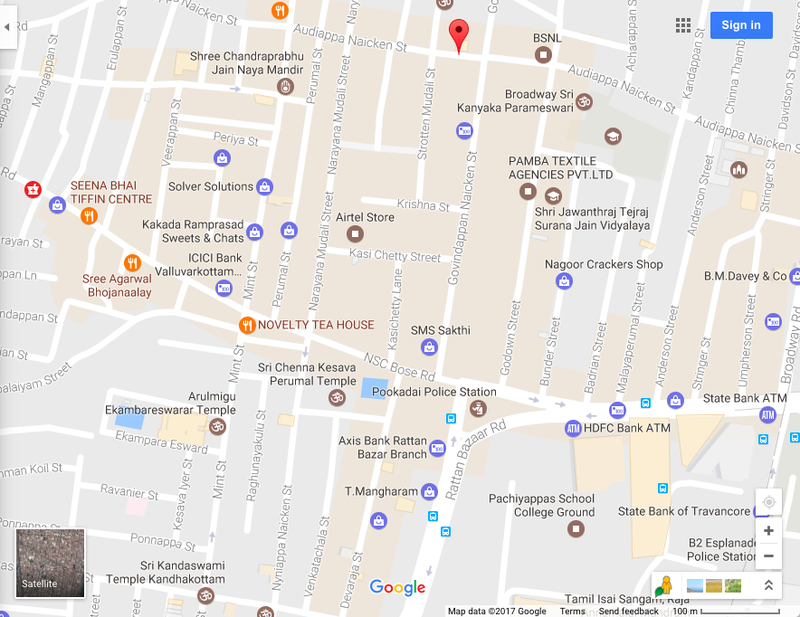 So we took an auto to go to the restaurant – Kakada Ram Prasad which was just a 5 to 6 minutes walk away from this store. 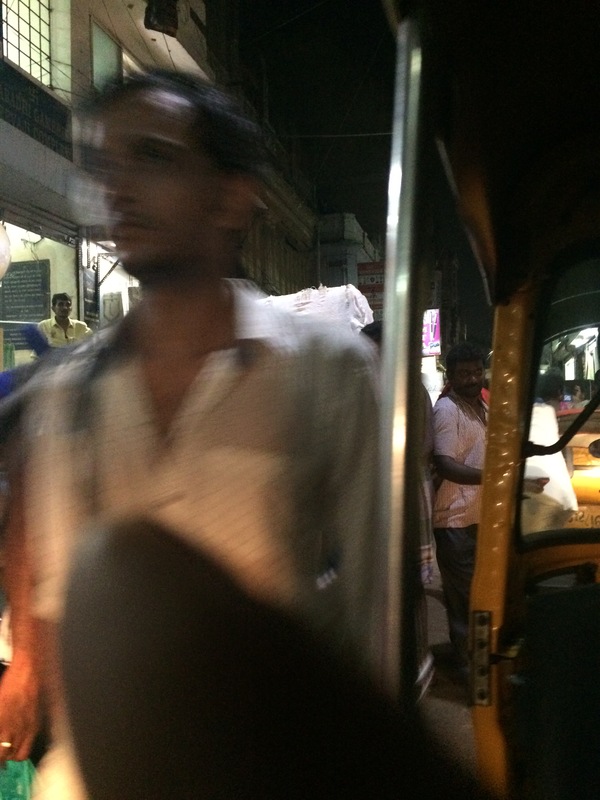 Here are some pictures that I took of the streets which we went through – we had walked on them and then were in the auto. 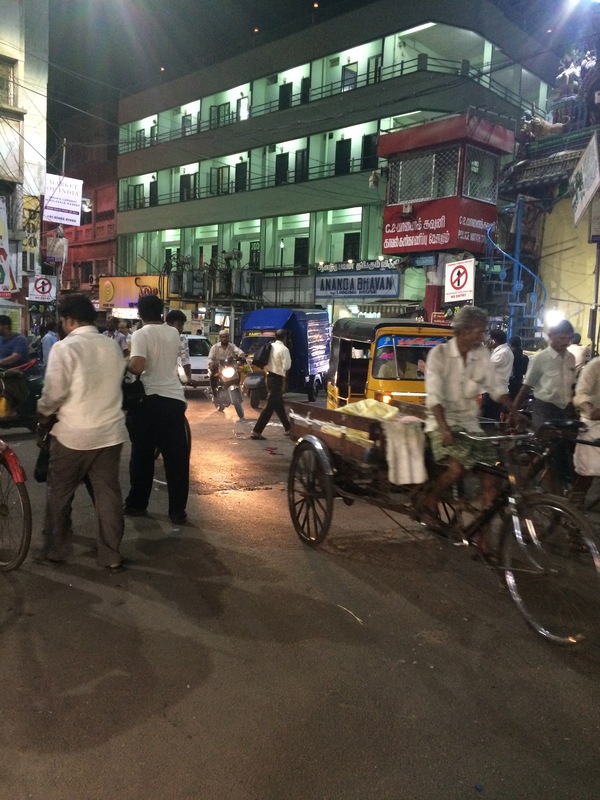 We ate a hurried (“chaat”) dinner at Kakada Ram Prasad which was overflowing with customers and then went to the Mint Street junction to find an Uber to go back. To our surprise an Uber was 6 minutes away. I took some pictures at 8.50 pm of the Mint Street cross road – utter chaos. Our woes didn’t end here. Google maps made the Uber driver to take an earlier turn and he was standing near a Jain temple and closer to Krishnan’s school. There was no way that he could reach us till the next day, so we took a cycle rickshaw and went to the Uber driver’s location. We entered the car and again thanked whoever created the air-conditioning in cars and plonked ourselves down in the back seat, completely drained out. We reached home by 10 pm and Krishnan’s shirt had still not dried fully. All this pain for some dried figs :)… but such is life. We go through a whole lot of pain for something that is probably not worth the effort. 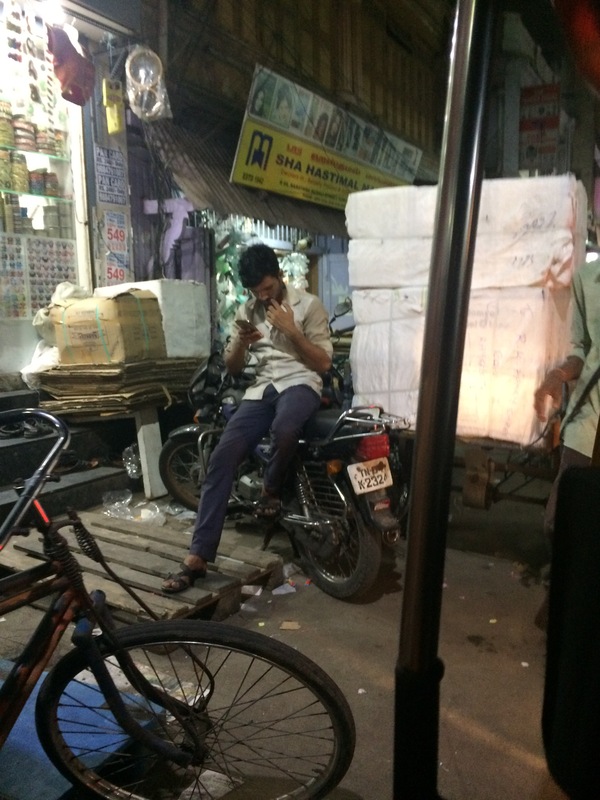 All this trip needed was a slightly better plan of reaching just that shop on Audiappa Naicken street in an auto from either the Elephant gate side or the Pookadai police station, buy whatever and scoot out. But then hindsight is 20:20, always. Here’s a map of the historical George Town or Mint or Sowcarpet area .. there is so much history here and I have an idea of how we can preserve the market while removing the pain of traffic. That will be another post because am drained out just looking at this map :):).